This page provides access to ATLAS Physics Events and Plots. 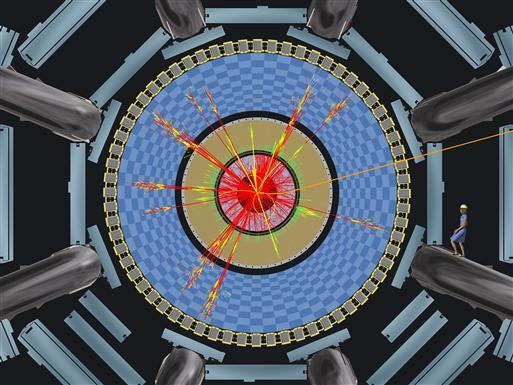 When protons or heavy ions collide in the centre of the ATLAS detector, many new particles are produced, which then pass through the detector from the collision point. The detector components are designed to take a kind of snapshot of this event, recording the points in the detector where the particles passed. Charged particles leave tracks, most charged and neutral particles leave energy deposits, neutrinos pass right through leaving only an imbalance of momentum. Event displays, like the ones presented here, allow physicists (and you) to visualise the collision in order to investigate what happened when new particles are produced at the very centre. In many cases, short-lived particles were produced during the collision, which then immediately decayed (transformed) into new particles. Only the relatively stable particles (those with longer lifetimes) make it out into the detector. Individual events are not enough for physicists to complete their investigations. In many cases different reactions can produce similar-looking events. To get a better understanding, the properties of similar events are accumulated into histograms (also referred to as plots). One very common property to plot is the reconstructed mass of combinations of exiting tracks, as this can allow us to discover new particles. See the full ATLAS Physics Events and Plots collection on the CERN Document Server.